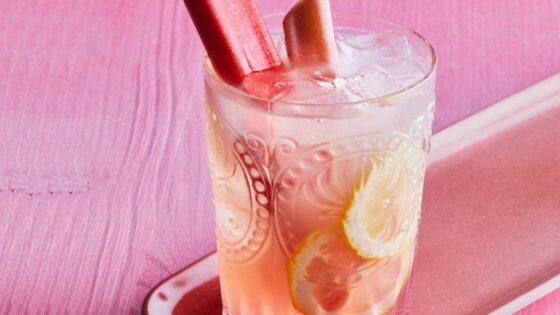 "Fresh rhubarb is cooked down and chilled to create the base syrup for this naturally pink lemonade. Perfect for springtime!" Stir 1 1/4 cups water, sugar, rhubarb, and salt in a small saucepan. Bring to a boil, stirring to dissolve sugar. Reduce heat to medium-low and simmer to the consistency of syrup, about 6 minutes. Strain through a fine-mesh sieve set over a Mason jar; discard solids. Chill, covered, at least 1 hour. Stir chilled rhubarb syrup, remaining 4 cups water, and lemon juice in a large pitcher. Chill until ready to serve. Pour into ice-filled glasses. Garnish with fresh rhubarb stalks. If using frozen rhubarb, thaw before proceeding with the recipe.